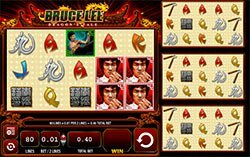 One of the best and most influential martial artists to have ever lived comes alive to help you kick some serious casino a$$ in Bruce Lee Dragon's Tale video slot. Not only was Bruce Lee an incredible Jeet Kune Do master, but he was a pop culture icon, philosopher, instructor and filmmaker. Most relevant to us however, is that he is the guy that will help you battle your way to huge winnings on 80-reels and 4 different reel sets! One of the best and most influential martial artists to have ever lived comes alive to help you kick some serious casino a$$ in Bruce Lee Dragon’s Tale video slot. Not only was Bruce Lee an incredible Jeet Kune Do master, but he was a pop culture icon, philosopher, instructor and filmmaker. Most relevant to us however, is that he is the guy that will help you battle your way to huge winnings on 80-reels and 4 different reel sets! The reels are decorated in well-done Asian theme with casing detail where the tale of the Dragon is in full force. You’ll see Bruce Lee in various poses, Asian language characters, nun chucks, a yin yang and card symbols Jack through Ace. All of these symbols work across the slots bold casing and reel sets to give you some incredibly rewarding features. Bruce Lee Wilds – The Bruce Lee Logo is the games wild symbol and will substitute for all symbols, except the yin yang feature to complete winning combinations when possible. Yin Yang Scatter Free Spins – The Yin Yang symbol is the triggering symbol for free spins. If you can hit 3, 4 or 5 free Yin Yang Symbols anywhere on the reels, you’ll earn yourself 10. If you do get 5 Yin Yang symbols, as an added bonus wins on your 10 Free Spins will have a 2x multiplier applied to your wins. When all 4 reel sets trigger the Free Spins Feature simultaneously, up to 12x multiplier is available; 9X when 3 sets of reels trigger free spins; 6X when 2 sets trigger free spins; and 3X when triggered on 1 set of reels, other than the main set. Super Multi-Pay Feature – The Super Multi-Pay Feature is the four reel sets with 20-lines on each giving you up to 80-slots total. The first and largest slot grid is the main one and the special part of the Super Multi-Pay feature is, any Wilds or Scatter symbols that you land on this first reel set will transfer over to the 3 smaller reel sets. After the symbols transfer to the other three reel sets, the other reel sets will finish spinning and give you the possibility for extra rewards!